Bromham stands on the River Ouse just to the west of Bedford. Its long narrow stone bridge is medieval in origin but was extensively altered in 1813 and 1902. The bridge used to carry the main A428 road but there is now a bypass. 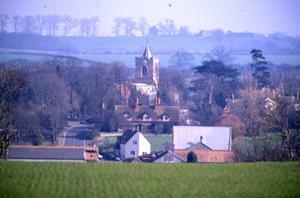 From the bridge there is a good view of the medieval church which stands on its own in parkland by the river. In the park stands Bromham Hall, a substantial mansion possibly late medieval in origin. At the west end of the bridge is Bromham Mill and Gallery, a 17th century watermill restored to working order by Bedfordshire County Council, and a popular tourist attraction. There is also a picnic site and nature sanctuary nearby.